It is a nice warm afternoon, perfect for visiting the restaurant ‘Katsuo Fune’ near Katsurahama Beach on an empty stomach. 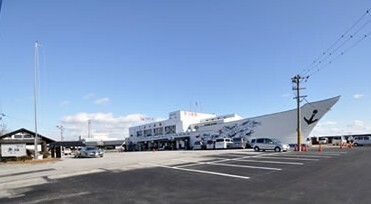 In the huge ship-shaped building, visitors have a chance to experience grilling katsuo no tataki. The staff greets you at the front door and asks which course you would like to eat: Katsuo no tataki teishoku (with rice and miso soup) or Katsuo no tataki tanpin (a la carte). After ordering visitors are handed a long pole with a huge slab of katsuo (“bonito”) skewered on the end. 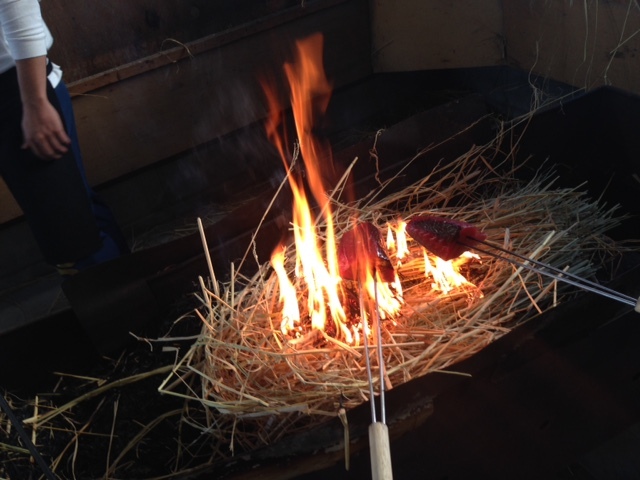 Then Nishimoto-san, the head cook, guides you to the grilling station and prepares the rice straw fire for grilling. 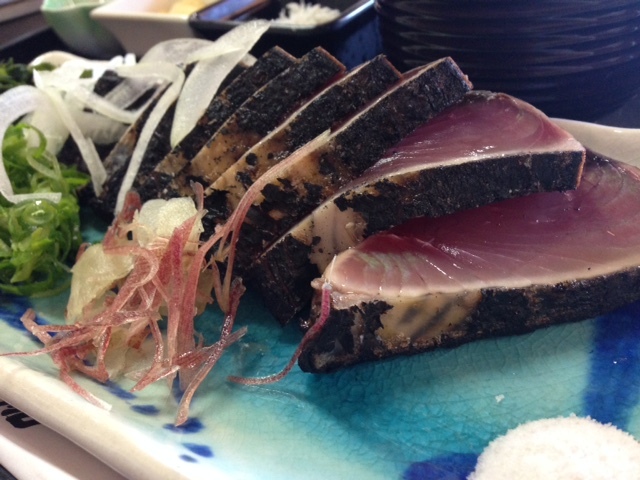 Kochi’s signature dish is Katsuo no Tataki— grilled bonito. The skin is lightly roasted, leaving the interior raw, then sliced thickly and served with garlic, shiso, spring onions, ponzu, and salt. It’s a popular dish among locals and visitors alike. Katsuo no Tataki came into being during the Meiji Era (1868-1912), as a dish to serve to foreigners that would be similar to steak. The fish itself must be roasted above the rice straw which gives a unique taste to the fish. During the sessions of roasting bonito fish, Ishikawa-san, in her 60’s, explains that the bonito fish they are using are mostly taken from Japan especially from Kochi. And of course, the fish itself can be very expensive depending on the season. “Before it’s roasted,” she explained, “ the fish smells very strong. So to reduce the smell, we tap the fish with a knife or hand coated with salt. Because the slices are thicker than sashimi, it’s needed to get the seasoning into the fish. The ‘tapping’process is unusual,” she adds “so that’s why we all called it ‘tataki’. Mrs. Ishikawa explains that there is no particular license for the dish, she makes makes sure that every chef on duty for serving the fish must meet strict standards. The dish is served year round, because no matter if it’s winter or summer, Kochi people love to eat Katsuo no Tataki. But, she explained, the bonito fishing season opens April or May, and ends in September or October. After the friendly conversations about the seasons, Mr. Nishimoto gently takes down our roasting poles and tells us to flip it once after a side is roasted. In less than 2 minutes, our Katsuo no Tataki is ready and he cuts the fishes for us into thick slabs, served on a beautiful long plate with a pinch of salt. In additional, we can add the spring onions, garlic,seaweed, etc. by ourselves. Before eating, the staff recommends to try shio tatami (just salt) first. For the favorite flavors, Kochi people prefer the shio to the tare. After sitting down on the table for two, the writer looked around at the happy guests eating the freshly roasted and hot sliced katsuo no tataki. Looking closer at the meat, it is very beautiful and looks so clear that indicates the fish is good in both quality and quantity. 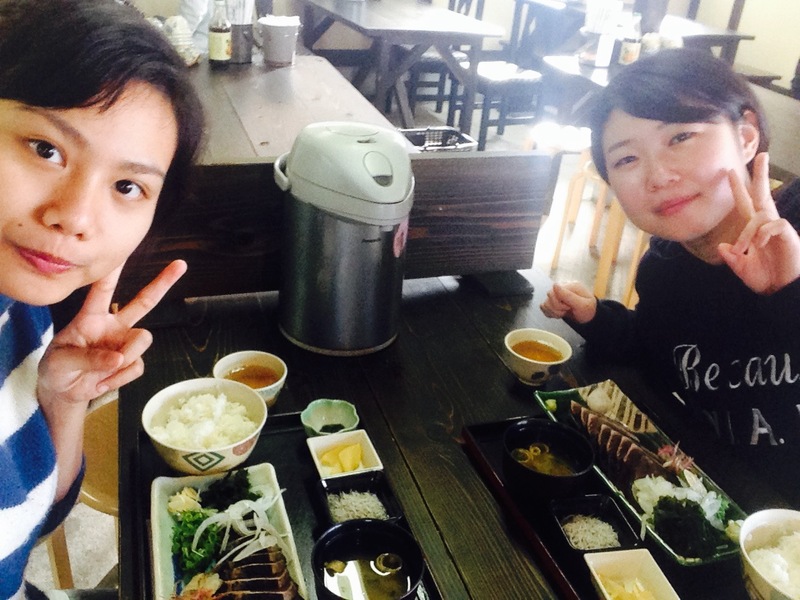 The smell is fine, the taste very delicious, especially with shio. Along with miso and hot fresh white rice, every bite of katsuo no tataki is guaranteed to make a happy tummy. I didn’t know that Katsuo no tataki has a quite long history. I became hungry after reading this. I’m going to stay Kochi one more year, so I should try to make Ktsuotataki! I was really surprised I didn’t know that katsuo-no-tataki was made like a steak for the sake of being served for foreign people, and I didn’t know where the name “tataki” came from. I am happy to know that. After I came to Kochi, I ate katsuo- no- tataki for first time in my life! I became to love it after eating it. I’m glad to know about the long history of it and also the real meaning of Tataki. I’d like to go there and eat the fresh and delicious katsuo-no-tataki.